← Professional Corporations – Why Incorporate? Any professional income that you earn in excess of $132,000 is taxed at 43.7%. Most physicians, dentists, lawyers, etc. will easily earn more than this amount. Many will have substantial amounts of income taxed at the maximum rate. Compare this to the tax rates on income in a professional corporation. In BC, the first $500,000 of active business income is only taxed at 13.5%. When compared to the top personal rate, there is a difference of over 30%. But what if you are a specialist physician like an ophthalmologist, or a dentist or lawyer with an extremely successful practice? It’s not uncommon for professionals to earn in excess of $500,000 in a year. 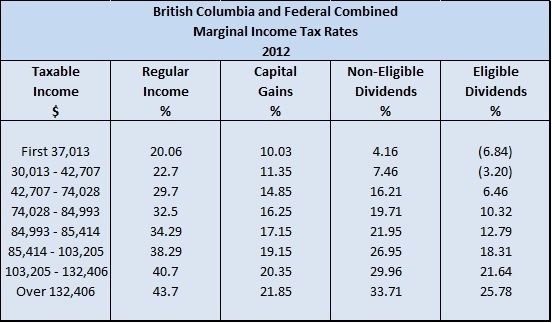 In BC, active business income over $500,000 is taxed at 25%, a difference of almost 19% from the top personal rate. That’s a substantial reduction in taxes. It has a huge impact on your ability to pay for items for your business. Most of your business expenses such as licenses and dues, staff wages, overhead, etc. are going to be tax deductible. There is no difference between incurring a deductible expense personally or in a corporation. Because it’s deductible, no tax is paid on the income earned to pay for the expense. What about meals and entertainment which are only 50% deductible? Imagine you have meals and entertainment expenses of $2,000 in a year. Of this, only $1,000 is deductible for tax purposes. You only have to earn $1,000 to pay for the deductible portion. However, you have to use after-tax dollars to pay for the non-deductible part. If you are in the top personal tax bracket, you need to earn $1,776 to pay for the non-deductible $1,000. That same non-deductible $1,000 in a company requires only $1,156 to be earned. Overall, $2,000 of meals and entertainment expense for your business requires $2,776 earned personally compared to $2,156 earned corporately, a difference of $620. The difference is even larger when an expense is not tax deductible at all. What if the business pays $2,000 in life insurance premiums? Unless the life insurance policy is assigned as collateral for a business/investment loan, the premium will not be deductible. That $2,000 premium will require $3,552 if paid personally compared to only $2,312 if paid for a corporate policy, a difference of $1,240. Of course, savings of this level are only a drop in the bucket if you are earning $200,000 in a year. The effect is magnified when you have larger amounts. What if you bought a practice or a building for $750,000? What if you have loan payments of $30,000 a year plus interest? Only the loan interest is deductible. The principal payment of $30,000 has to be paid from after-tax earnings. If you haven’t incorporated, that loan payment requires you earn $53,285 to pay it. Corporately, you only have to earn $34,680; over $18,000 less. Another way to look at it is that you have an extra $18,000 to pay down the loan. Imagine how much faster that loan will be paid off. This entry was posted in Architects, Business Professionals, Businesses, Chiropractors, Dentists, Doctors, Engineers, Health Professionals, Income Tax, Incorporation, Lawyers, Medical Residents, Mortgage Brokers, Optometrists, Professional Corporation, Realtors, Uncategorized, Veterinarians and tagged income tax rates in canada. Bookmark the permalink.